MIDDLEBURG, PA – Advanced Concrete Systems, Inc. reached a milestone in their business, setting foundation number 25,000 on April 29th, 2014 in Klingerstown, PA. Since 1985, Superior Walls of America, Ltd. licensees and franchisees have manufactured and installed over 100,000 Superior Walls precast concrete foundation systems. The 25,000th foundation was set for Randy Phillips Construction of Herndon, PA, who will be building a 2500 sq. ft. home. Randy says he uses Superior Walls for the ease of having the foundation complete in a matter of hours, giving him a quick start on the building process. 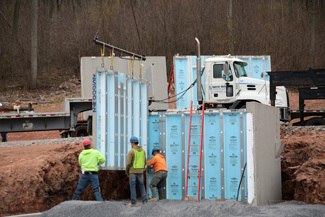 The custom-made foundation uses 9-foot XI walls, which have R-12.5 insulation built into the wall cavity. The walls include precast openings for windows and doors while stud facings eliminate the need for additional wood framing prior to interior finishing. Using fewer materials helps reduce the carbon footprint of the new home’s construction process. Certified installation crews set the walls in place in less than one day, so that home construction can immediately begin the following day. Advanced Concrete Systems, Inc. is located in Middleburg, PA and employs approximately 100 people in Snyder County. They service Pennsylvania, Maryland, and West Virginia.